Generously grease and flour 12-cup fluted tube cake pan. To make your cake batter blend all cake ingredients except Cherry Juice, Food Color, Peppermint Extract and Vegetable Shortening until it is smooth. Pour about 2 cups batter into greased pan. In small bowl, mix 1 cup of batter, Cherry Juice/Food Color and Peppermint Extract. Carefully pour pink batter over white batter in pan and then very gently spread it out with a spatula so that you can't see any white batter. This will create your color ribbon and keep you from getting a a big blob. Carefully pour remaining white batter over pink batter. With a clean spatula, spread the white batter for the pink batter. It might start to blend a little but try not to. It will bake into a marbled effect if you don't blend the two batters too much. Bake for 30-45 minutes. Different cake pans have different patterns and depth so some will take longer than others. You'll know your cake is ready when the top is golden brown and you can stick a bamboo skewer in the cake and remove it cleanly. Using the bamboo skewer, make a dozen or so little stabs into the top of the cake.You're releasing moisture from the cake to help it cool and also release from the pan. Let your cake cool for 10 minutes and then turn your cake pan upside down on a large serving dish. While your cake is baking, make your glaze. 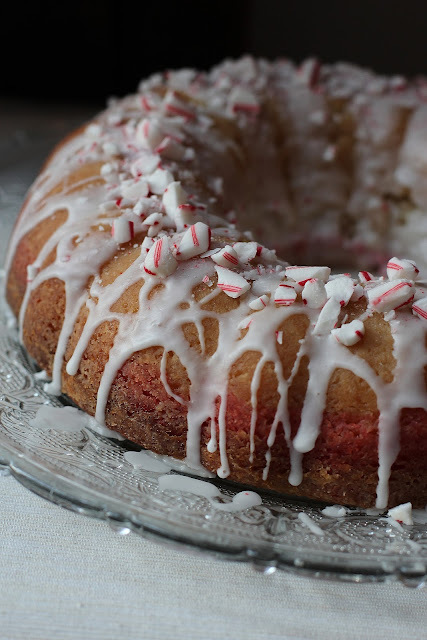 In small bowl, mix all the glaze ingredients except the crushed Candy Canes with a whisk until creamy. Then drizzle your glaze over the cake. Sprinkle crushed Candy Canes on top. Serve slightly chilled with hot chocolate. I really like the juxtaposition of the two. So wonderful. I want to put candy canes on everything this time of year. looks awesome! i want to make this for our christmas party. thanks! and no baking powder/soda? i live at high altitude and always need to adjust my baking. just checking to be sure! thanks. What a kick!! My Hebrew birthday is the 4th day of Chanukah,which this year is December 24. This will make a lovely birthday cake!!! I love your site and your recipes and I tell people about them all the time. Thanks for doing all the hard work of substituting!! it does look like a pound cake. thanks for the feedback! Your cake looks awesome! 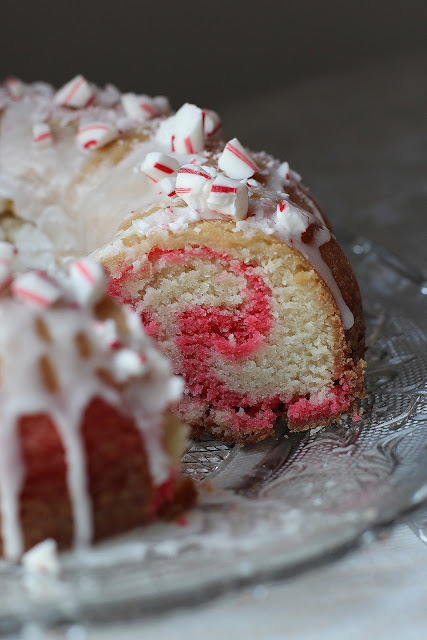 I'm going to a Christmas potluck party on Saturday, and I may try to make it (if I can acquire a bundt pan). Also - I wrote the better part of my dissertation drunk, and I didn't even go back to edit it. But I'm pretty sure no one's ever read it, so I don't think it matters. This cake is, in my opinion, a thing of beauty. So is the coconut milk the canned coconut milk or the Coconut Milk that is an beverage? Great Question! We've been using Silk coconut milk that comes in like a milk carton lately.